Abstract. Three weeks after the deadly Bohol earthquake of Mw 7.2, which claimed at least 222 victims, another disaster struck the Philippines. This time, Super Typhoon Haiyan, also known as Typhoon Yolanda in the Philippines, devastated the Eastern Visayas islands on 8 November 2013. Its classification as a super typhoon was based on its maximum sustained 1 min surface wind speed of 315 km h−1, which is equivalent to a strong Category 5 hurricane on the Saffir–Simpson scale. This was one of the deadliest typhoon events in the Philippines' history, after the 1897 and 1912 tropical cyclones. At least 6268 individuals have been reported dead and 1061 people are missing. In addition, a wide area of destruction was observed in the Eastern Visayas, on Samar and Leyte islands. The International Research Institute of Disaster Science (IRIDeS) at Tohoku University in Sendai, Japan, has deployed several teams for damage recognition, relief support and collaboration with regard to this disaster event. One of the teams, the hazard and damage evaluation team, visited the affected areas in the Eastern Visayas in mid-January 2014. In this paper, we summarize the rapid damage assessment from satellite imagery conducted days after the event and report on the inundation measurements and the damage surveyed in the field. Damage interpretation results by satellite images were qualitatively confirmed for the Tacloban city area on Leyte Island, the most populated city in the Eastern Visayas. During the survey, significant damage was observed from wind and storm surges on poorly designed housing on the east coast of Leyte Island. 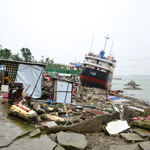 Damage, mainly from surface waves and winds, was observed on the east coast of Samar Island. How to cite: Mas, E., Bricker, J., Kure, S., Adriano, B., Yi, C., Suppasri, A., and Koshimura, S.: Field survey report and satellite image interpretation of the 2013 Super Typhoon Haiyan in the Philippines, Nat. Hazards Earth Syst. Sci., 15, 805-816, https://doi.org/10.5194/nhess-15-805-2015, 2015. Super Typhoon Haiyan devastated the Eastern Visayas islands of the Philippines on 8 November 2013. The International Research Institute of Disaster Science (IRIDeS) at Tohoku University in Sendai, Japan, deployed several teams for damage recognition, relief support and collaboration with regard to this event. In this paper, we summarize the rapid damage assessment from satellite imagery conducted days after the event and report on the inundation measurements and damage surveyed in the field.